Stern deploy. – Dirty wet dog , boats and sailing. One of the projects i have been working on is getting as many of the boat’s working lines aft so that i can do more of the sail handling and anchor drills from aft, this comes from the near MOB experience while reefing last year , that and the awkwardness of just getting forward. There are 2 main things happening : firstly adapting the rig so that i can reef from the cockpit, in a later post i will show how that is intended to work , and secondly i have always wanted to be able to deploy a bow anchor from aft as well. The job i have been trying to do ie make a closed bow fairlead is part of that….on that one its a bit of a fail at the moment in that the pattern i have made just isn’t up to the standard of having a very expensive bronze casting made from but the concept tested today seems to be ok so i am going back to the fairlead with some different ideas. Today i dry fitted the fairlead and messed around with my new anchor and its weighted warp. 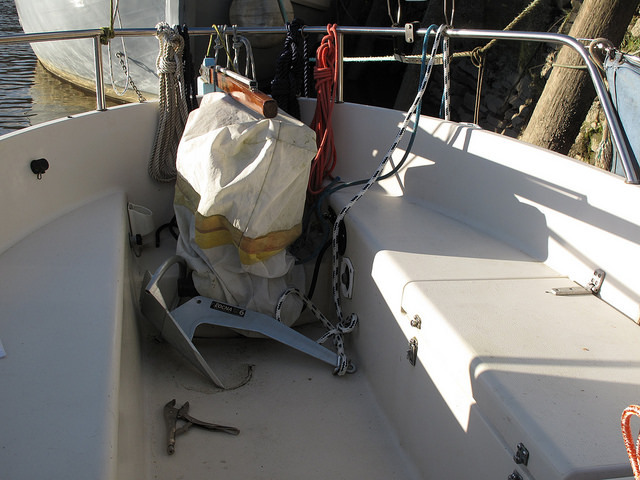 Here is the Rocna sitting where i want it aft and the fairlead on the bow. The idea here is simple in that when i want to anchor i just heave the anchor over the rail and then work with the weighted warp which leads forward to the fairled and back along the side deck to what will be a newly fitted cleat. The cleat incidentally is one that i remove from just underneath the bow fitting (where the gaffer tape is) although a very strong 10 inch cleat its fastenings were as i suspected absolutely ‘naff’….just M6 bolts threaded into the GRP moulding. When i fit the cleat to the deck aft there will be a plywood pad under the deck at the least and when things are warmer i will bog in some nee layers of cloth covering the hull-deck join. For now i am going to set things up just with the weighted warp and treat the new anchor as a lunch-hook only but i will also have a bucket of new 7mm chain aft as well and for serious anchoring i will add that into the rode..takes a couple of minutes with the shackles and cable ties all together there, that should then be a bombproof set-up as a 7g Rocna is intended for boats up to 30 feet and several tons. The fairlead isn’t a good enough job to go the foundry, its so asymmetric as to be ‘wonky’ but i am considering a plan of reinforcing it, coating it and using it as it is. The forces on it should always be down onto the moulding or very low down on the cheeks as the bow is pulled around. It should be possible nowadays to build one entirely in laminates. Slightly beyond me but i think i can see how to do it using this one as a form. Next Liberty, Mystery, Veracity and honesty.